ICAN is the largest infection control organisation in Africa and has gone from strength to strength in education, training and extensive networking across Africa with membership in 24 countries. 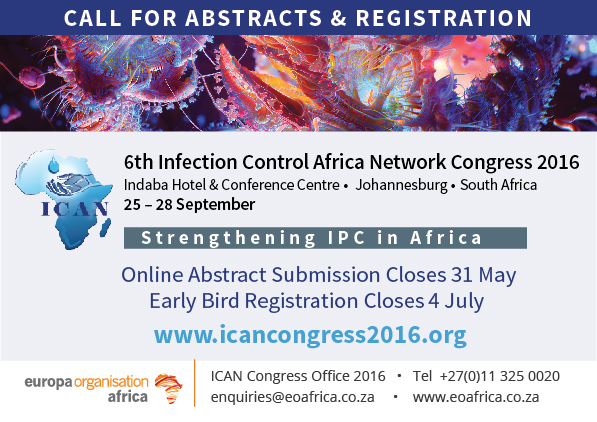 ICAN would like to hear more about IPC related research and the successful implementation/strengthening of IPC programmes in health facilities across the African Continent and invite you to present your research at the 6th ICAN conference to be held in Johannesburg between 25-28th Sept 2016. The abstracts will be published in the Antimicrobial Resistance and Infection Control (ARIC) journal and therefore the formatting will comply with the requirements of the journal.